3 December 2018 Seals and Pressure Ridges! Submitted by Mike Penn on 2 December 2018. Click the media button to see the newest YouTube video of the pressure ridges and seals. This Weddell seal is relaxing in the Antarctic sun in the pressure ridges near Scott Base ("Kiwi"/New Zealand) in Antarctica. Yesterday we went to an area near Scott Base (a New Zealand station) that has pressure ridges. Kiwi (New Zealand) Scott Base, Antarctica as seen from the sea ice. 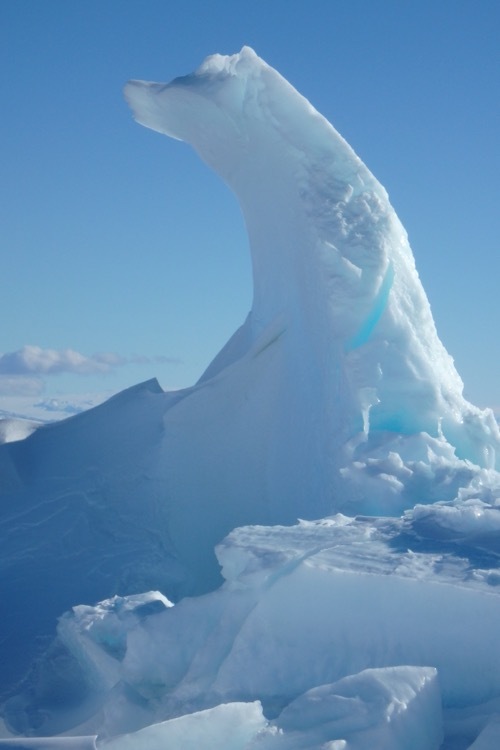 The pressure ridges are formed by tidal forces and glacial pressure – there is a thick sheet of sea ice that meets the land, and tidal forces (ocean tides) cause the ice to buckle. Two winters of thick sea ice grinds and heaves when the ocean pushes it against the much larger Ross Ice Shelf (normally the ice here breaks up each year, but last year was too cold and that didn't happen – so this sea ice is two years old). The effect is beautiful...and dangerous! 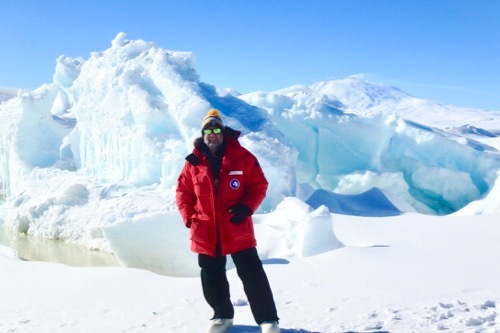 PolarTREC teacher Mike Penn stands near pressure ridges on sea ice near Scott Base, Antarctica. The pressure ridges create beautiful and ever-changing formations in the ice near the New Zealand Scott Base. What are all of those flags in the snow all about? 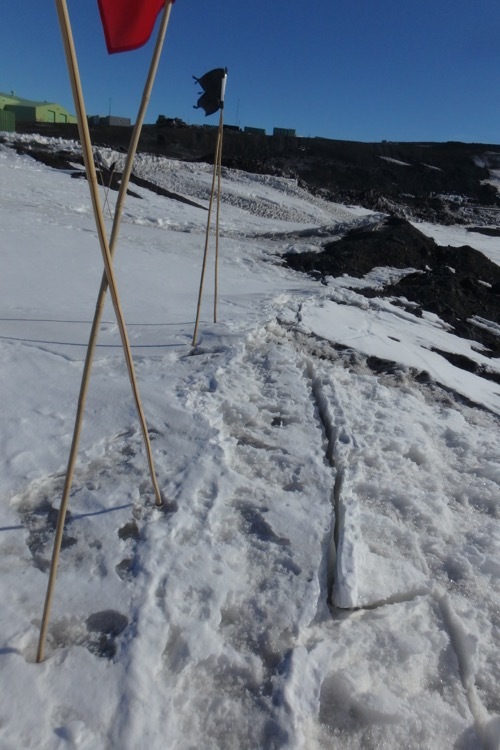 Black flags marking cracks and crevasses in pressure ridges near Scott Base. There are flags to map out a safe route. Black means danger – usually crevasses. A crevasse is a dangerous and deep crack in the glacier or ice shelf that can be covered over by blowing snow. There were black flags EVERYWHERE in this area! But, as long as we stayed on the path that had been checked out to be safe, we were pretty confident and comfortable. We had poles (for probing the consistency of the ice and looking for crevasses and voids under the surface) and ice axes to help with climbing. The red and green flags indicate an area is safe (why red means "safety" was a surprise to me and seems counter-intuitive). Most of the established ice roads are marked with red flags. Red and green can also be used just to mark the location of something that you might need to find after it gets buried in snow. In our case, it would be the battery boxes of our Automatic Weather Stations. Blue flags indicate fuel caches, fuel lines and occasionally things that might be necessary for survival, like a survival bag). Seals are common in this area. These are specifically Weddell seals. 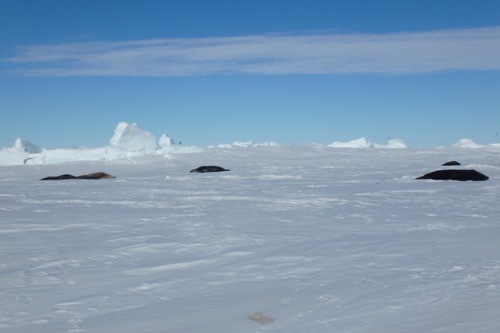 Lots of seals in the area of pressure ridges, near the Kiwi Scott Base. Since this ice is floating on the ocean it is affected by the tidal movement of the water below. It is also being pushed against by the ice shelf. The sea ice and the ice shelf are different. The sea ice is "temporary" and usually breaks up in January (the warmest part of the Antarctic summer). The ice shelf is a glacier that is drifting off of the continent and has pushed hundreds of miles into the sea. Where those two types of ice meet (and where they each touch solid ground – like here on Ross Island) you can expect to see pressure ridges. Where there are pressure ridges there are cracks in the ice that lead into the ocean below...and that means...seals! A Weddell seal pup relaxing in the sun in the pressure ridge zone near New Zealand's Scott Base, Antarctica. Since the seals are mammals, they need to breathe air. They can hold their breath for close to an hour, but at some point, they need to breathe and this is just the place. They also rest and have their pups on the surface! We did see a few pups but since they were born two months ago they are getting big. Some of the members of our party could tell the difference, but they all looked about the same to me! 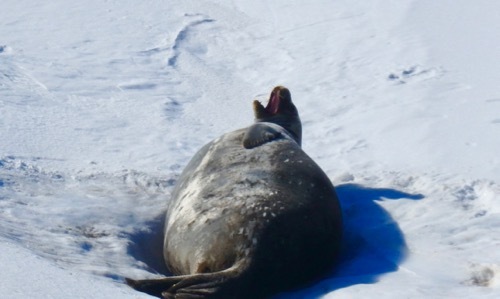 For more on Weddell seals, I'll refer you to my friend Bridget Ward's Expedition. Here is a brief description of the Weddell seals from her expedition's page: "Weddell seals are one of the best-studied seals and a classic example of adaptation to the extreme Antarctic environment. A large body size and thick blubber layer help them to stay warm both on and under the ice. Their streamlined shape, body oxygen stores, and collapsible lungs allow them to reach dive depths of 600 meters (almost 2,000 feet!) and remain underwater for over an hour. However, they do not begin life with these advantages. Weddell seal pups are born on the sea ice with a small body size and almost no blubber." 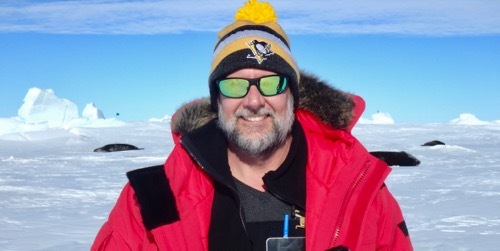 PolarTREC teacher Mike Penn stands on sea ice in the pressure ridge zone with Weddell Seals in the background. what type of seals were those? Landen, They are Weddell seals. If you look back at the journal that may have been mentioned several times? There is a link in the last paragraph to my friend Bridget Ward's expedition that is all about Weddell Seals. Hello Mr.Peen i would like to know when you see the black flags are you afraid of standing on a crack in the ground or are you most afraid of falling into a crevasses. And if there was to be a lot of wind and you get lost what would you do. Riley, As far as the crevasses go, I was just fine when I saw the flags because then I knew exactly where the cracks were! They are very careful here about keeping up to date on weather conditions. If it looks like the weather will be bad we aren't allowed to go far away from town. If the weather gets bad when you are out we will check in with our radios and stay put and wait for the weather to improve. Ryan and I keep asking, "What about the stinky seals?" Hey Dad, you said that blue flags marked fuel lines and caches. Most vehicles are diesel on the ice correct? How do they keep the fuel from freezing. also the batteries is there a small heater in the cache to extend the battery life or are the caches insulated enough underground? I think i saw a yeti cooler in another picture is that a cache? Garrett, (my son!) that is a good question! Diesel ( -25˚F with anti-gel additives) has a higher gel point than gasoline (-44˚F) ... I know that when it gets to "Condition 1" (Severe weather is in progress. All personnel must remain in buildings or the nearest shelter. Winds greater than 55 knots sustained for one minute, or visibility less than 100 feet sustained for one minute, or wind chill greater than -100°F sustained for one minute.) so I guess it isn't a thing because we aren't supposed to be out in those conditions anyway. The batteries in the vehicles are heated (plug in) with simple wraps. 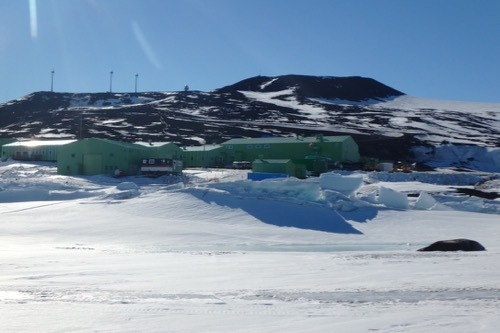 I read somewhere that South Pole Station runs almost exclusively on JP-8 (a type of jet fuel) which has a gel point of -47˚F. It depends on what time of year on whether it is insulated under "ground". Like a cave in a temperate zone, underground at the pole is a constant -58˚...so I'm not sure since that is below the gel point of all of the fuels. We are flying about 500 Miles to the grid west tomorrow, so I'll have lots of time to ask the pilot. I'll get back to you on this! Dad, The sun is constantly up right now but as the season ends and constant darkness approaches during the winter are there a few days where it is a 24-hour sunset sky (that would be really cool)? 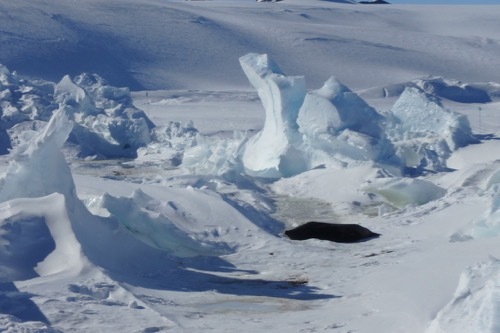 Also, the seals come out of the ocean through cracks in the ice near pressure ridges. Do they ever get confused and wander into a crevasse or accidentally fall into them? They may be smarter than that but they don't really look it. Looks awesome, love ya! Miranda (My daughter! ), Yes, there ARE days that are sunset in the Antarctic Autumn and sunrise in the Antarctic Spring as the sun slowly sets or rises. Sunset here is February 20, 2019 01:46 AM and at the South Pole it is March 23, 2019 01:33 PM. I don't know the answer to the seals falling into crevasses question...although I doubt that they move very far from the hole they came up through. They are pretty slug-like on the surface! I just googled "Antarctic Sunset" and there are lots of pretty photos and youtube videos of the sunset. I love you too! How many seals have you seen so far? Abby and Ryan, We saw dozens of seals when we were near the New Zealand Scott Base and McMurdo Station. The definitely have an odor, but it wasn't overwhelming or repulsive. It kind of reminded me of the smells at the zoo.